A trio of U.S. real-estate investment companies is attempting a rare union of equals. Being bigger could justify the effort for Colony Capital. Senior executives at the NorthStar duo involved may find more motivation in some $200 mln of deal-triggered payouts. 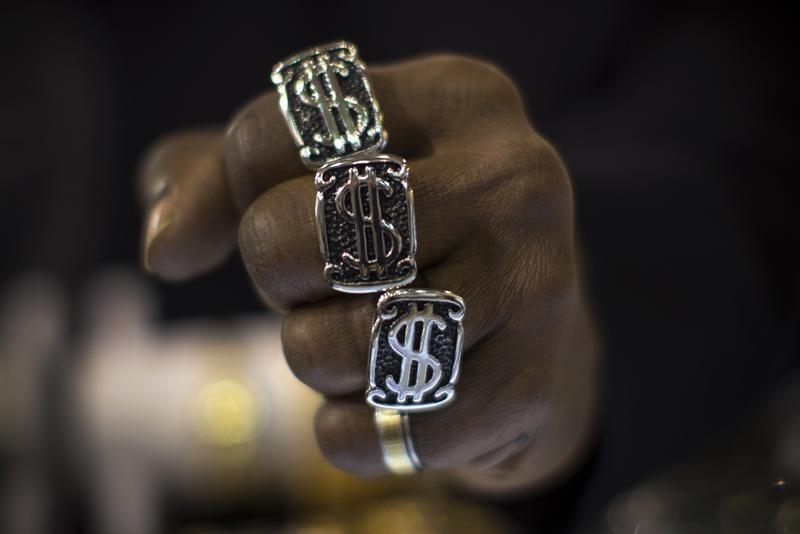 A man wears U.S. dollar sign rings in a jewellery shop in Manhattan in New York City November 6, 2014. Land and Buildings, an investor in NorthStar Asset Management, sent a letter to a special committee of the company’s board on June 6 saying it was “deeply disappointed” by the three-way deal it had struck with Colony Capital and NorthStar Realty Finance. The price NSAM is receiving “does not fully reflect” its intrinsic value, said Land and Buildings. It also noted that “with reasonable compensation levels for NSAM management,” it thinks the valuation in the deal could be achieved on a standalone basis. “We question who was looking out for NSAM shareholders during the transaction process, as in our view, NSAM’s management team was clearly not, since management wins regardless of the valuation or consideration paid to NSAM shareholders,” it wrote in a letter signed by Land and Buildings founder Jonathan Litt. NSAM, Colony and NRF said on June 3 they would combine in an all-stock merger of equals to create a real-estate investment trust with some $58 billion in assets under management. Under the terms of the deal, NRF shareholders will own about 33.9 percent of the combined company, Colony shareholders will own about 33.25 percent and NSAM shareholders will own about 32.85 percent.